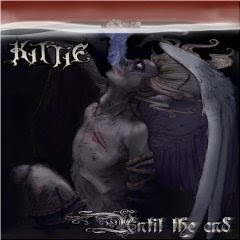 Hall of the Mountain King: Review: Kittie, "Until the End"
Review: Kittie, "Until the End"
The members of Kittie have come a long way since their 1999 debut when they were a group of teenagers trying to prove they could hang with the boys in the burgeoning nu-metal scene. On their third album, the band has completed its evolution into a true metal band, as evidenced by the pummelling opening track "Look So Pretty," which veers into death metal territory. On the whole, "Until the End" is a much heavier album that shows a lot of growth. Musically, it's probably the most solid album Kittie has done, and it shows the influence of bands they've toured with over the years. That influence is most noticeable on songs like "Sugar," which opens with a blast of good, old-fashioned speed metal that leads into some chugging, offbeat Meshuggah-style rhythms. The melodic "In Dreams" and the lead single "Into the Darkness" look back at the band's past, while "Burning Bridges" - a song that's sure to prick up any extreme metal fans' ears - plants their feet firmly on the road to the future. Though they still seem to be searching for just the right balance between gnarly, heavy riffs and melodic hook-laden rock, the Canadian girls' third outing should give them some real respect in the metal world. Review: Iced Earth, "The Blessed and the Damned"